GERMANY: Hydrogen produced by surplus wind and solar energy can become cheaper than natural gas by the 2030s, according to new analysis. Technological advancements such as the mass production of electrolysers will lead to economies of scale and enable lower capital expenditure, analysts at Berlin-based Energy Brainpool claimed. Meanwhile, the higher penetration of wind and solar power in the grid will allow for excess renewable energy to generate storable hydrogen, the analysts wrote in their report for Greenpeace Energy. How far the price of hydrogen produced by renewable energy sources will fall will also depend on "how high the share of renewables in the electricity system is and how much excess current is thus available", the report’s authors added. Further drops in the costs of wind and solar power will also underpin cost reductions in hydrogen production from renewable energy, the analysts stated. In their report, the analysts highlighted International Energy Agency (IEA) forecasts for the costs of natural gas production and for hydrogen production derived from renewable sources. Natural gas prices are set to rise steadily until the 2040s, from €0.017/kWh in 2020 to €0.032/kWh by 2030 and €0.041/kWh by 2040, the IEA claimed. By contrast, IEA analysts forecast that production costs for hydrogen generated by wind power are set to fall from "about €0.18/kWh" to €0.13/kWh by 2020, to €0.12/kWh by 2030, and to between €0.021/kWh and €0.032/kWh by 2040, analysts at Energy Brainpool highlighted. 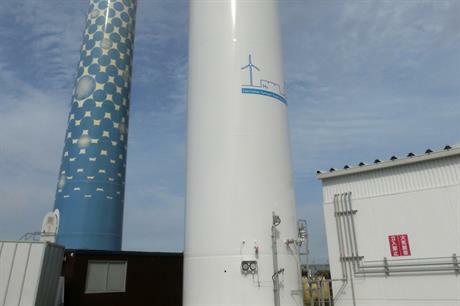 Sönke Tangermann, board member at Greenpeace Energy, said: "(Hydrogen generated from excess renewable energy) will be cheaper than the fossil alternative at the time when it becomes indispensable to ensure full supply security in a renewable electricity system. "For this to succeed, the federal (German) government must create the necessary framework conditions for the expansion of wind gas technology in this legislative period." Renewable energy can create hydrogen through electrolysis, whereby water is split into hydrogen and oxygen. The hydrogen can then be stored to help balance supply and demand of energy.